We are Tennesse bound this afternoon. Julie and I are traveling to Nashville to spend Thanksgiving with her mother, Lois, and sister, Diane, and Diane's family. They live in Brentwood near Franklin which is south of Nashville proper. Julie's birthday is on Tuesday. That day we will travel to Linden (southwest of Nashville on the map). My mother, Margaret, and step-father, Neal, live there. Our girls are spread over the States and will be having Thanksgiving with either their own families or with friends---Leah in Texas, Elisha and Lori in California (San Diego and Sacramento respectively), and Shamar in Grand Rapids, Michigan. Shamar has to work Thanksgiving Day, but she has some good plans made for being with friends. I'll take the laptop with me and hopefully post a blog or two while we're on the trip. To our "Blog Family"---Blessed Thanksgiving! Enjoy the trip, John. We'll be enjoying a Middle Tennessee Thanksgivin as well, just a few miles southeast of you in Coffee County. May your trip be safe and blessed. It always so nice to spend Thanksgiving with family....it's a warm feeling to be surrounded by family members on this special celebration....and hey also visit my Thanksgiving Blog sometime and share more of the Thanksgiving fun....have a great Thanksgiving!!!! Britol is higlighted on the map. 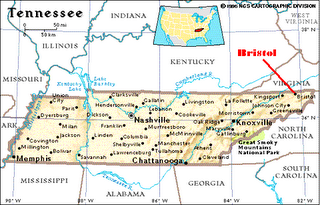 We live 20 min.s from there (Kingsport).